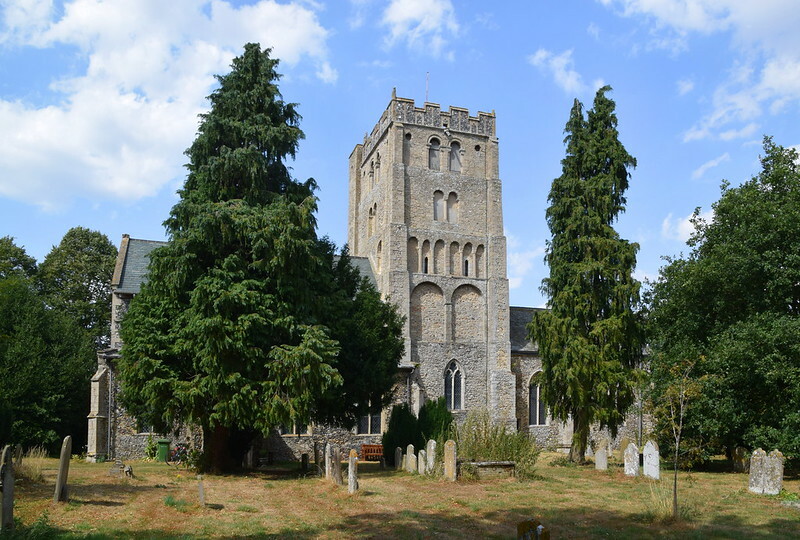 The tower of South Lopham church is an impressive sight by anyone's standards, rising from the trees as a landmark along the Thetford to Diss road. It looks grand in pictures, but when you see it in real life you know it to be more than simply the largest Norman church tower in East Anglia. There is something primal, earthy about it. We can relate to later Gothic architecture, if only because the Victorians interceded for us. But the meaning behind Romanesque is somehow difficult to comprehend, representative of a people whose attitudes and values are almost impossible for us to grasp. If archaeologists discovered that Ely and Durham cathedrals had been planted on Earth by aliens, we probably wouldn't be terribly surprised. By a stroke of someone else's misfortune, we can fairly closely date the building of the tower. 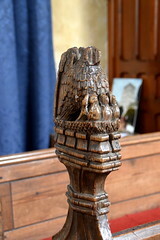 It was the gift of William Bigod to the monks of Thetford. 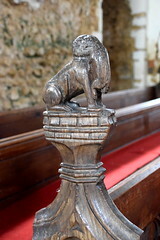 The Bigods were a family more usually associated with Suffolk, and the border is just two miles from here. They were a ruthless family, rich and powerful, and they used their muscle to increase that wealth and power. They held Suffolk and south Norfolk under their vicious thumb. William of Normandy was content to leave the running of a large part of East Anglia to their merciless grip, concentrating his energies on those upstarts in the Fens, who had the gall to actually fight back. Bigod met a watery fate in November 1120, going down in the ship that also drowned William, heir to the English throne. Arthur Mee calls this one of the bitterest tragedies that ever cast a shadow round our throne, so I can't imagine what Barmy Arthur would have made of the shenanigans of the current mob. The tower probably dates from about twenty years earlier. The parapet is obviously a 15th century addition. 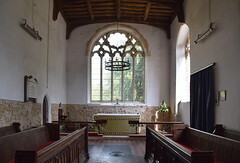 There was already a church here when Bigod was cracking the whip across the back of his masons, as shown by a circular Saxon window in the north nave wall. But the great glory of the nave is the high west window, a beautiful hammerbeam roof overhead. The late medieval period was a wealthy one here, and we can be grateful that they decided not to rebuild the tower. Mind you, how anyone would ever be able to demolish such a thing is beyond me. 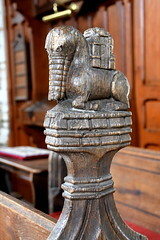 Inside, a sympathetic 19th century restoration has left lots more evidence of 15th century activity. 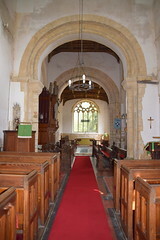 In the last few years the plaster has been removed at a lower level in the crossing and the chancel, revealing the stairway and a previously unknown doorway. 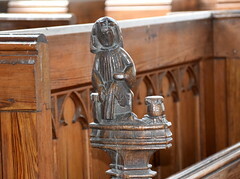 There are late medieval bench ends, including a delightful one which may be a man or a woman with a cooking pot but has also been interpreted as a blacksmith. 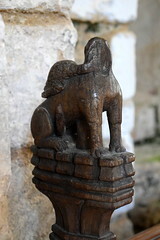 A dog steals a duck while a cat makes off with a rat, and there is also a splendid elephant with a castle on his back. 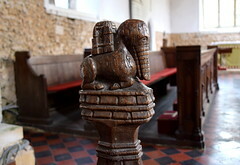 The carver had obviously heard tell of such beasts, and may even have seen one (they were a common feature of medieval travelling circuses) but if he had then he did not have a very good memory, for he interpreted its trunk as a long beak. He also gave it hoofs. 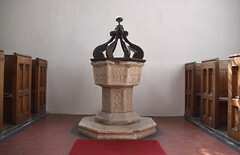 The tracery font is near-identical to that at neighbouring North Lopham, and the east window of the south aisle, presumably by Powell & Sons, depicts the story of Dorcas. We see her giving clothes she has made to the poor, and then when she dies St Peter is shown examples of her needlework which impress him so much that in the third panel he brings her back to life. Dorcas was a popular subject at the time as an example of a virtuous and charitable woman, but perhaps it is not too fanciful to imagine this had a resonance locally because of the village's considerable weaving industry in the 18th and 19th centuries. 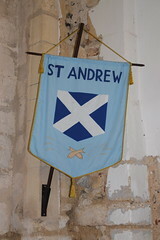 In the top lights are St Peter and St Andrew, but in fact the medieval dedication of this church was to St Nicholas. Church dedications fell into disuse for the 250 years or so following the Reformation, and the enthusiastic, well-meaning but often inaccurate 18th century antiquarians who plundered the diocesan archives confused the dedication here with that at North Lopham, and swapped them over.